A new meetinghouse was built on this Centre Street site in 1701, located across from Ingersoll’s ordinary. 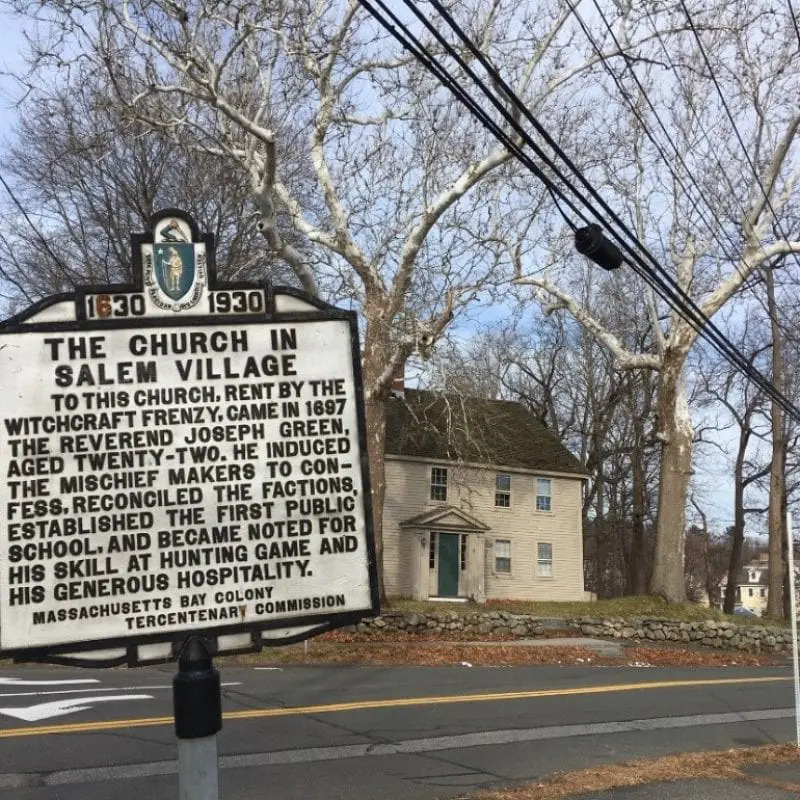 It was here, fourteen years after the witch trials, that Ann Putnam Jr. stood in her pew as Reverend Joseph Green read her apology aloud to the Salem Village congregation. Putnam, now 29 and the caretaker of her younger siblings following the deaths of her parents in 1699, wished to join the Salem Village Church. At this time, to become a full member of the church one was required to have a conversion experience and a profession of faith. In her statement read by Reverend Green she stated she wished to “lie in the dust” for the wrongs she had done, especially to Rebecca Nurse and her two sisters. Putnam blamed her behavior on “a great delusion of Satan.” Ann further stated that in her childhood she accused, “Several persons of a grievous crime, whereby their lives were taken away from them, whom now I have just grounds and good reason to believe they were innocent persons.” Members of the Nurse family were in the meetinghouse that day to hear Putnam’s apology. 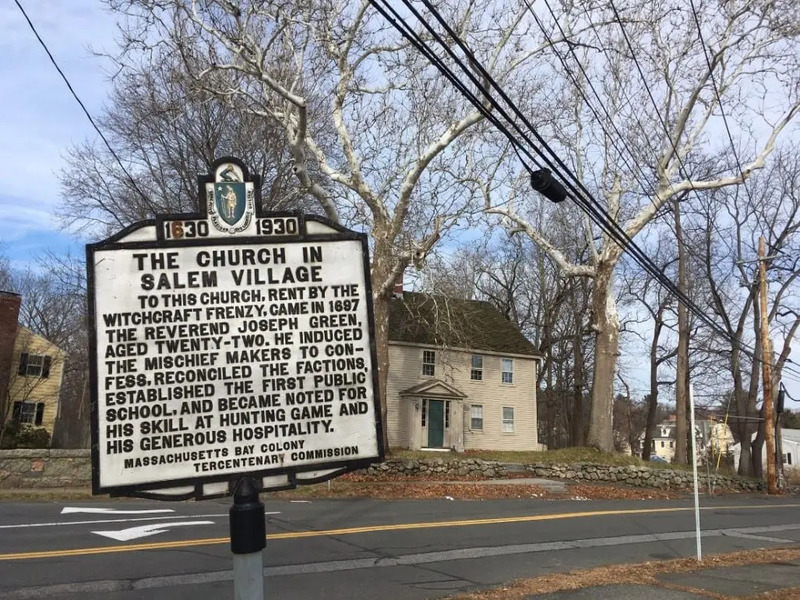 The first Salem Village meetinghouse, where ministers from James Bayley to Joseph Green preached from 1679-1701 and where many of the witchcraft examinations took place in 1692 was abandoned in 1701. This original structure was located across from the present-day Witch Victims’ Memorial farther east on Hobart Street. Reverend Parris’s replacement Joseph Green came to Salem Village in 1698. He was only twenty-two, and a recent graduate of Harvard College. Prior to moving to Salem Village, he was a schoolmaster in Roxbury, MA. He was ordained shortly after in November of 1698, and subsequently married the daughter of Reverend Gerrish from Wenham. Even at the young age of twenty-two, Green was well-suited to reconcile the warring factions in Salem Village. He undertook the substantial task of bringing the “dissenting brethren” back into the Village church. Two years after his arrival, he reseated the congregation so that Putnams and Nurses regularly sat together. In addition, he rescinded the excommunication of witch trials victim Martha Corey. The actions of this young minister were instrumental in helping Salem Village community move past the terrible events of 1692. In 1708, Reverend Green encouraged Salem Village to build a school and hire a person “to teach their children to read and write and cypher and everything that is good,” and initiated an annual Thanksgiving collection for the poor. One of the first to be helped by this charity was William Good, the widower of the executed Sarah Good and father of Dorothy Good. Joseph Green died in 1715 at the age of 40, after serving as Salem Village minister for eighteen years. He is buried in Wadsworth Cemetery in Danvers. Additional Note: The building that stands on this site today is a modern one, built in 1980. 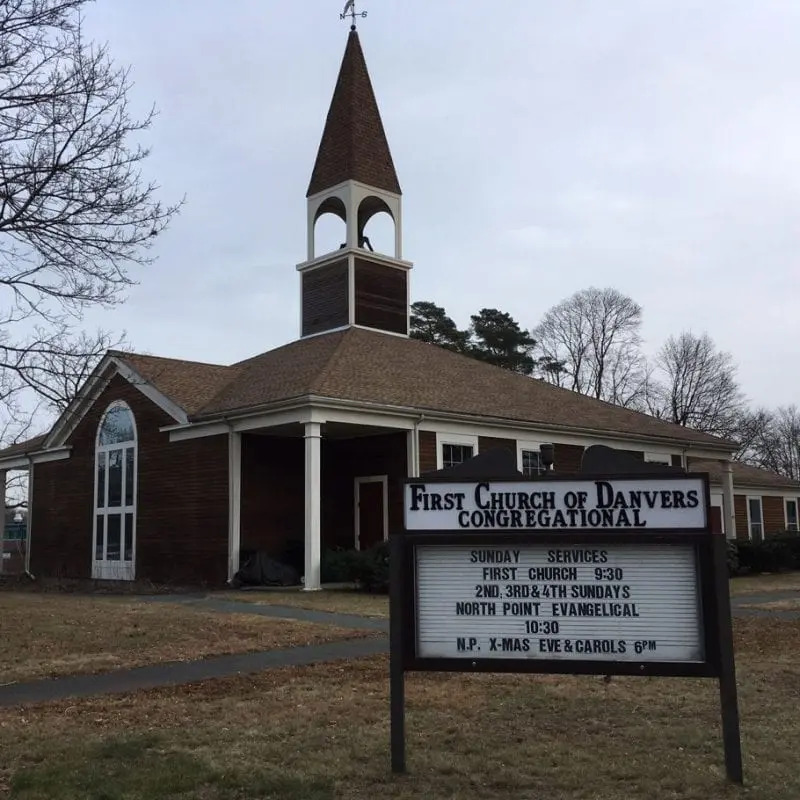 First Church of Danvers today. 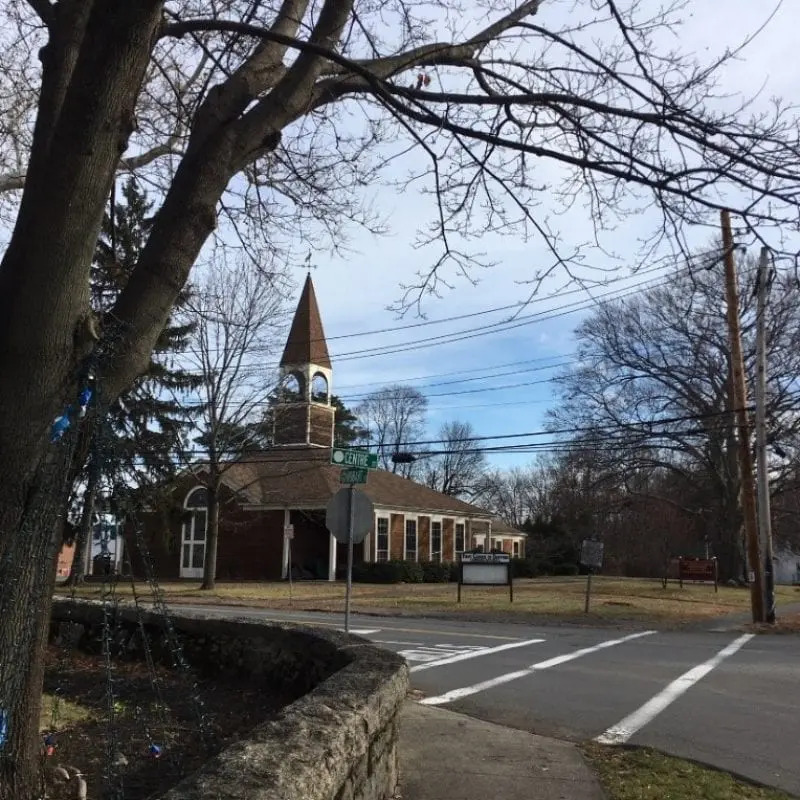 The site of the second Salem Village meetinghouse is across the street from Ingersoll’s ordinary. A modern, 1980 building stands on the site of the second Salem Village meetinghouse today.